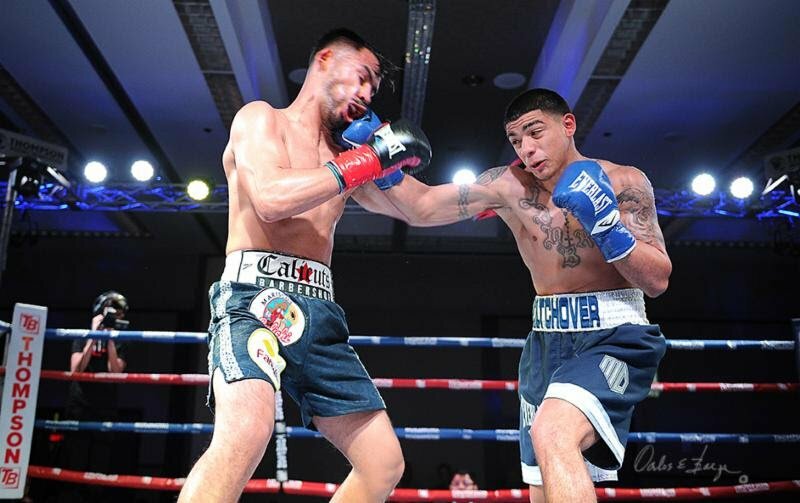 Junior lightweight Michael Dutchover (8-0, 5 KOs) delivered an impressive performance in his main event debut Saturday night from the Doubletree Hotel in Orange, Calif.
Dutchover, 20, thoroughly out boxed and outmaneuvered solid prospect Ricardo Lopez (7-2-2, 6 KOs) to the tune of a one-side, unanimous decision win (scores: 59-55 all around). Indeed, Dutchover put his stamp on the fight from the outset. The first three rounds consisted of the Texas native firing shots from a variety of angles. Lopez, who is based in Tijuana, Mex., tried to get back in the game in the fourth and fifth rounds, but Dutchover used his counter punching ability to stymie the attack. Prior to the fight, Dutchover promised to show off a more polished skill set after recently working as the chief sparring partner to world champion Oscar Valdez. He certainly looked like the high-end prospect that many predicted he would become once his impressive amateur run came to a close. Heavyweight Scott Alexander (14-2-2, 8 KOs) of Riverside, Calif. earned a fourth round TKO victory over Pedro Rodriguez (22-4, 18 KOs) of Houston, Tex. in the “Night of Champions” co-feature. Alexander and Rodriguez fought a close fight through three rounds, with neither boxer seemingly able to find the range. The tide changed, however, in the fourth round when Alexander found openings and connected on numerous occasions. At the conclusion of the fourth, Rodriguez informed the ringside physician that he had sustained an Injury to his right hand and was unable to continue. The injury resulted in Alexander winning by TKO. Junior welterweight Luis Zarazua (8-0-1, 4 KOs) of Edinburg, Tex. used a steady body attack to win by lopsided unanimous decision over veteran Edgar Ivan Garcia (5-16-1, 1 KO) of Tijuana, Mex. Scores: 60-53 twice, 59-54. Zarazua dropped Garcia in the first round with a pinpoint body shot. Garcia managed to shake it off, but never got his offense going. Zarazua did a good job of staying active throughout the 6-round fight, mainly targeting the body with heavy shots. Super welterweights Anthony Franco (2-0) and Derrik Clayton (1-2, 1 KO) opened the “Night of Champions” event by firing haymakers at each other. Franco, who looked equally comfortable as the aggressor or counter puncher, landed the strongest shots, but Clayton had his moments as well. Ultimately the judges sided with Franco by way of majority decision (39-37 twice, 38-38). Franco fights out of Redlands, Calif. and is trained by Henry Ramirez. For more information, please visit ThompsonBoxing.com.